If you're looking for ways to boost your metabolism, you may have heard that drinking cold water can help. While it does up your metabolism a little, it may not be the best choice if you're trying to burn more calories for weight loss. The calories in the food you eat provide your body with energy. The number of calories you need a day is based on your metabolism. Your metabolism includes three factors: basal metabolic rate, daily activity and the thermic effect of food. BMR is the number of calories your body needs to support breathing, heart rate and other basic bodily functions, and makes up 70 percent of you daily calorie needs, according to the University of Arkansas for Medical Sciences. Daily activity refers to the calories burned during exercise and other physical activities such as brushing your teeth and walking to your car. This accounts for 20 percent of your daily calories, says UA Medical Services. The thermic effect of food refers to the energy required to digest food. 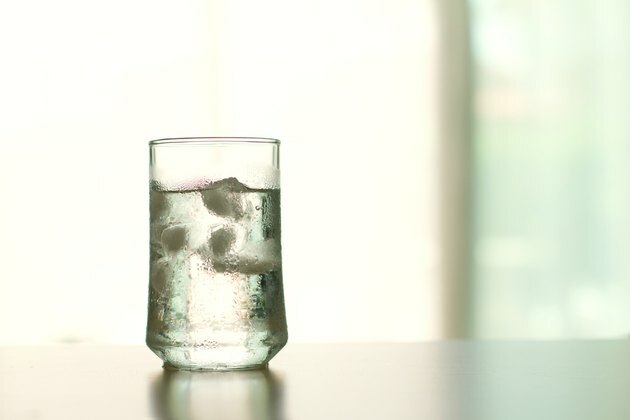 Drinking a glass of ice water burns some calories, but not much. According to the University of Washington, you burn 8 more calories for every 1 cup of cold water you drink when compared to drinking 1 cup of room temperature water. The reason you burn more calories drinking cold water than room temperature water is because your body is fighting, or burning energy, to keep your temperature at 98.6 degrees Fahrenheit. If you're trying to lose weight, those extra 8 calories, even if you drink a number of glasses of cold water a day, do not amount to much, says UA Medical Services. When it comes to weight loss, water makes a good beverage choice. It's easy to get and calorie-free. It also may help with your weight-loss efforts. Drinking water before a meal may fill you up so that you eat less. Also, dehydration makes you more hungry, says the University of Washington. Making sure you get enough water to prevent dehydration may also help you eat less. Daily water needs vary, but UA Medical Services recommends men aim for 15 cups a day and women 11 cups a day. But some of this water comes from your food, particularly fruits and veggies, which are loaded with water. Unfortunately, your genetic makeup plays a big part in determining your individual metabolism. Increasing your lean body mass, however, may help give your metabolism a bit of a boost. Strength-training exercises, such as lifting weights, squats and sit-ups, can help build up your lean body mass. Be sure to drink water before, during and after exercise to prevent dehydration and muscle tiredness. University of Arkansas for Medical Sciences: Does Drinking Cold Water Burn More Calories Than Warm Water?